10:00 A.M. TUESDAY MORNING FAMILY AND FRIENDS MAY GATHER AT FUNERAL AND PROCESS WITH US TO CEMETERY. 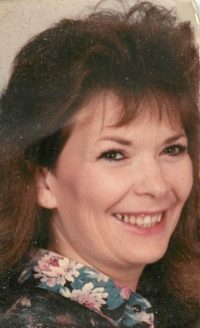 Jerri (Noehl) Walker, daughter of Jarom and Leatha (Powers) Noehl, was born March 7, 1959 in Wichita, Kansas and died Friday, June 8, 2018 at the Salina Regional Health Center at the age of 59 years. Jerri grew2 up in Wichita and attended school at Leon and Wichita. She worked in customer services for Dillon’s Stores in Wichita and Salina for the last 20 years. She was united in marriage to Scott Walker in Wichita on January 1, 1993. Jerri is remembered by her family and friends, as someone that loved the outdoors; whether hunting, fishing, camping or boating. Always accompanied by her husband Scott, they treasured their many happy times together outdoors. Jerri especially enjoyed time spent with family and friends. Jerri’s constant companion Maggie was her joy. Jerri will be forever remembered by her husband of 25 years, Scott; sons Jason (Ashley) and Tyler Cozart of Texas; grandchildren Anthony, Emily, Trista, Jordan; and brothers Anthony Noehl and Danny Troxel. She was preceded in death by her parents; son Jared Wright; and sisters Terri Siffort, Jane Troxel. A rosary & vigil service will be held 7:00pm Monday, June 11, 2018 at Tibbetts-Fischer Funeral Home, Belleville, Kansas. Graveside service and interment will be held 11:00am Tuesday, June 12, 2018 at St. Josaphat Cemetery, north west of Belleville, Kansas with Father David Metz officiating.